Handmade Sword of Eli. Influenced by the Movie Book of Eli. See Pictures, Prices, and Descriptions. Made by Scorpion Swords & Knives. 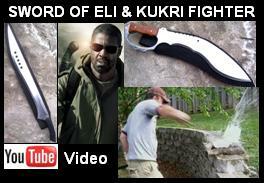 This machete is influenced from the one used in the movie Book of Eli. Eli is a lone traveler, wandering America's wastelands devastated by nuclear war 30 years prior. The stark landscape is littered with abandoned cars, crumbling buildings, and bombed highways. Water and food are scarce. Eli uses his sword to survive and fight his way through, to deliver his copy of this mysterious book to a safe location.